It's been a long time I wanted to talk about it, but recently work kept me so busy that I felt bad writing about something that I had no time to do. Now that I have little business trips scheduled I can practice again more steadily and talk about it without having the impression that I should be in the dojo rather than writing about it. To make long stories short, I've practicing traditional Japanese archery, or kyudo, since I moved to Japan. Kyudo 弓道 that literally means "the way of the bow" is an ancient Japanese practice that as evolved as an art, where performance is less important than the form, and require a perfect balance of body and mind. Obviously this is not an activity to burn your extra energy and your anger from work, for that kendo must be more appropriate! But rather a meditative physical activity where breathing and body inner strength are crucial. The bow is much longer than a classic archery bow, mine is a long bow, so about 2.3m, and the strength adapted to it's owner own strength. Same for arrows, their size and weight depend on the archer, when I started I had a 8K bow, now I have a 13K. 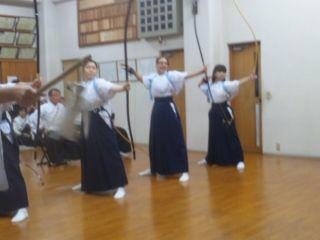 There are several things I love about kyudo. I guess the place where to practice is an important choice, and I am lucky enough to practice right in the middle of Ueno park, in the middle of ancestral trees and a quiet oasis in the city (except may be when it is hanami season). Actually, I practice it in a shinto shrine, actually, and it has been a great source of knowledge and understanding of Japanese culture to go so often there. Second it is not strictly speaking an indoor activity which I don't really like: the dojo is wide open to the "yamichi" 矢道 and it is not heated nor cooled o you can clearly feel the seasons! Though you can practice any time, day or night, rain or sunny: no excuse not to go! I also like this balance you need to have between a clear mind and a strong yet relaxed body and I can clearly see the differences when I'm preoccupied or managed to totally clear out all thoughts that could impede my performance. As any Japanese practice there are tons of cute goodies you need (OK, may be not really NEED, but that you can have!) 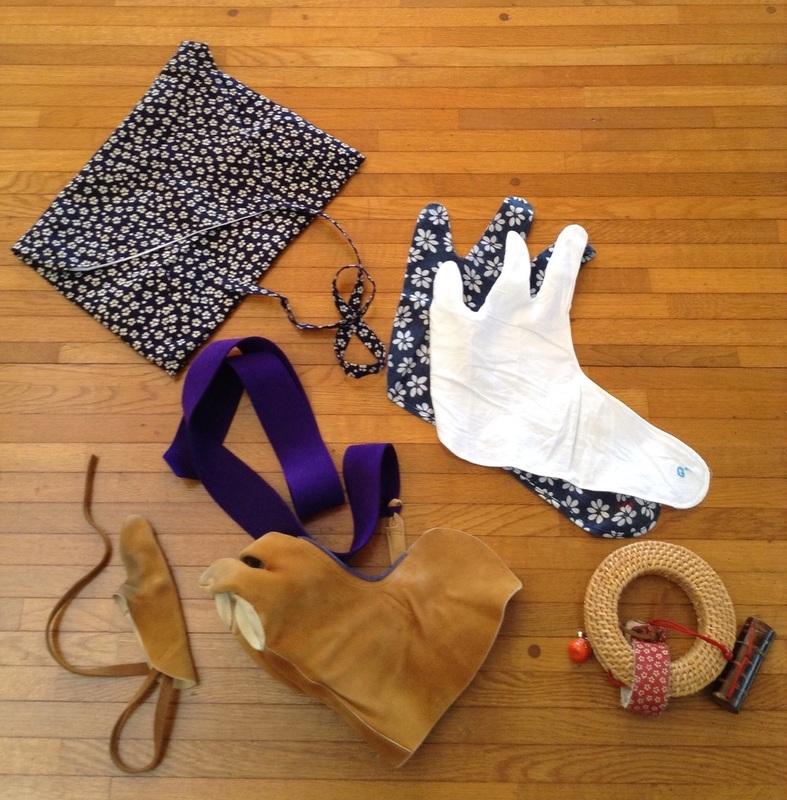 like the under gloves in many different colors and patterns, the glove cover, the bow cover etc... And of course, the regular outfit to practice is a hakama 袴 like in kendo, and for ceremonial shooting kimono and similar. There are many places in Japan where to practice and now it's becoming a popular practice among Japan fan in Europe and America, with dojo in many cities. For more information I recommend to check the International Kyudo Federation web site.